Most manufacturers use a steel tubing frame (14-gauge is standard) to provide support. Usually, you'll have a choice of a chrome or powder coat finish. Both are extremely durable, but chrome is more resistant to chipping and scratching. Powder coat is more affordable and also holds up nicely under heavy use, so it is often a question of aesthetics. Particleboard is standard for most cafeteria tables. It's lightweight and sturdy, so it's a great choice if you frequently move tables around. If durability is more important, you'll probably want to consider a plywood top. It's more expensive but is stronger and will hold up longer under heavy use. It also resists water and retains strength in high humidity. Almost all cafeteria table tops, whether particleboard or plywood, have a high-pressure laminate surface to make cleaning easier. Cafeteria table edges are protected with spray-on epoxy or vinyl molding. Spray-on epoxy costs more, but it won't chip off and offers a tighter seal. If you're thinking about investing in any feature of your table, this is the place to splurge; spray-on epoxy is unmatched at protecting plywood and particleboard tops. 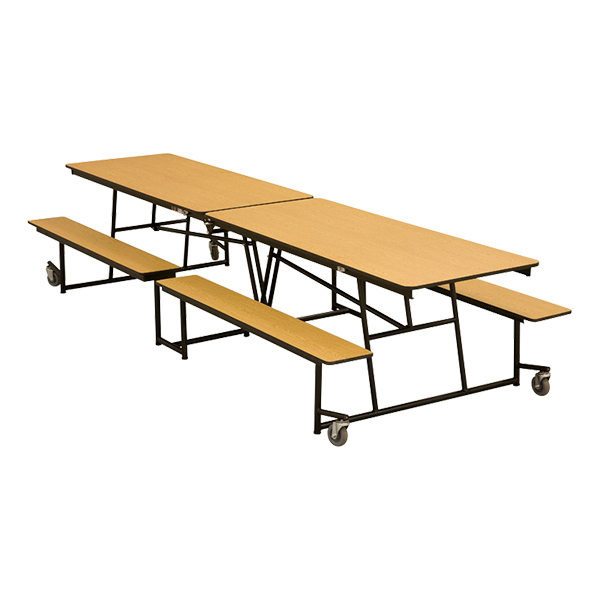 Attached - There are two types of attached seating for cafeteria tables. Benches and stools both have positive features worth looking into. Bench-style seating is great for younger students, because kids can sit as far apart or close together as the occasion demands. Cafeteria tables with attached benches can accommodate kids of all shapes and sizes. A table with eight-foot benches seats approximately eight to 12 kids. Look for bench units with more points of entry so kids don't have to step over each other to reach their seats. Stools attached to cafeteria tables are easy for kids to get in and out of. They're anchored to both the floor and the table for support. Stool seating works well if you know exactly how many students you'll have seated and if you want to give older students plenty of personal space. The number of stools per table is always clearly indicated, so you'll be able to figure out just how many tables you'll need. Heavy-duty plastic stools are easy to attach and you can order replacement stools individually as needed. Unattached – Of course, if you already have chairs, you'll need stand-alone tables. Tables without attached seating are often wheelchair accessible; check the height to see if they can accommodate handicapped students. Standard table height is 29 inches when benches and stools are 18 inches high. To accommodate younger students, look for tables that are 27 inches high and have 16-inch seats. How big is your lunchroom? Make sure there are enough seats for every student and plenty of room between tables. As a general rule, there should be at least 48 inches of aisle space. Don't forget to think about doors, columns and other fixed equipment in the room. Each situation is unique, and creating the perfect layout depends largely on the shape and size of your table. Place rectangular tables with attached seating 36 inches apart; place stand-alone tables 60 inches apart. All round tables should have about 54 inches of space between them. 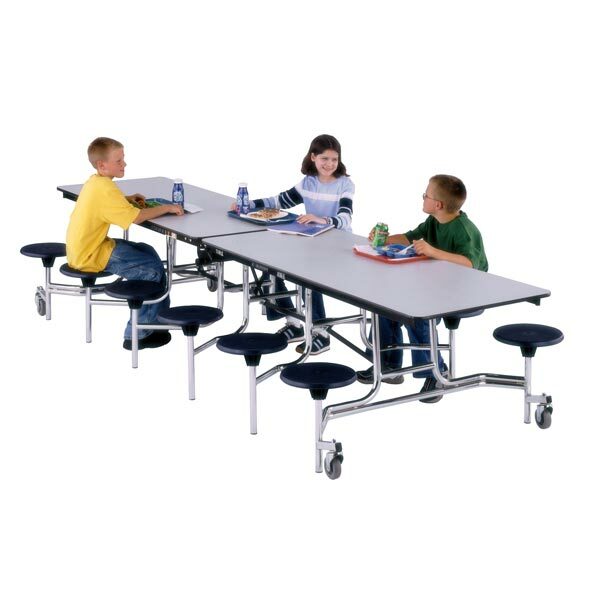 Convertible Tables - Do you use your school lunchroom for assemblies or study halls? If you need adaptable seating for a multi-purpose room, there are tables that switch from a bench with a tabletop to a bench with a backrest. Convertible bench units are the most versatile choice because they offer both auditorium-style seating and lunchroom seating. They're also great for handicapped students because they configure to accommodate wheelchairs. Mobile Folding Tables – Mobile folding tables are on casters and they collapse and nest together for storage. This makes clearing the room for special events a simple task. Most manufacturers offer safety locks that hold tables in a partly-folded position for easy cleaning. You'll find many models that are UL listed as well. Click here to check out our selection of cafeteria tables. If you want help figuring out which type of cafeteria table is best for you, don't hesitate to call us at 1-800-260-2776. Our friendly sales team is always happy to give advice and answer questions.